I’m excited because Booth 2302 is near the middle of that long, long convention hall–just a few yards away from one of the main entrances. Last year I was in a corner of the convention so far from the center of comics civilization that I may have actually been in another dimension! Sharing the booth with me will be the insanely funny Kevin Boze and wildly talented Stasia Kato of The Virgin Project. 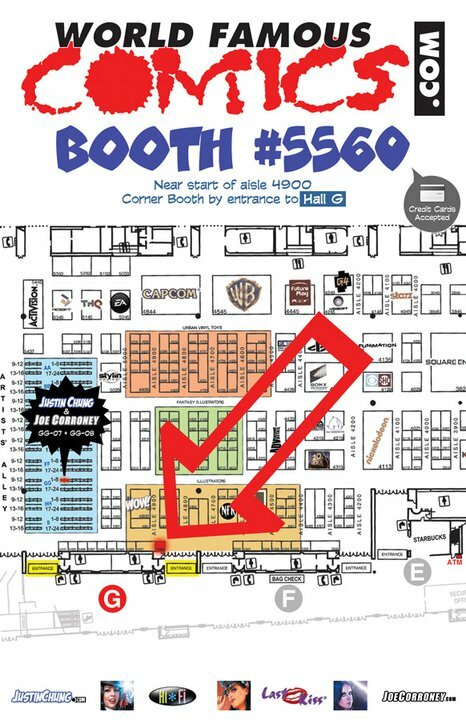 I’ll also be putting in daily appearances and selling cool stuff at Justin Chung’s World Famous Comics booth (#5560) which is just inside one of the entrances near the Illustrators and Fantasy Illustrators area. Beautiful models (Miracole Burns, Brieanna Brock and Dana Braziel-Solovy) and fantastic artists (Justin, Chung; Hi-Fi’s Brian and Kristy Miller; and Joe Corroney) will be there too. Schedule for all WFC artist and models here. Drop by and chat–or I’ll get lonely and depressed! Thanks for the info, John. Hope you have a fun time at Comic-Con. More importantly though … will Zatanna be attending? Hubba hubba! I can only hope, Kyle! Great location, John! Yea! I’ll stop by to say hi, especially if you can’t make it to the Little Lulu Fan Group Meeting on Sat…..